We often clean the outside of our shoes; after all, this is the part that people see. But do we ever think about how to clean shoe insoles? Probably not as often as we should, and maybe not until we notice they are becoming rather smelly. No matter how clean we are, there are times when we cannot prevent our feet from sweating. This encourages bacteria on our skin to multiply and cause nasty odors to emanate. The bacteria can thrive in our shoes, even after we have taken them off. Fear not, there are ways you can clean your insoles and soon have them smelling as fresh as a daisy again. Let’s see what we can do to rid our shoes of unpleasant aromas from our insoles. There are several different ways of cleaning insoles. Some of the methods depend on whether you can remove the insoles, and what material they are made of. Most types of insoles are removable. They are generally made from synthetic materials and foam. Consequently, it’s important not to get them too saturated when cleaning. Let’s take a look at a few simple tips and tricks. Often, plain old soap and water are enough to clean the dirt and debris from your insoles, and remove the smell they might be emitting. 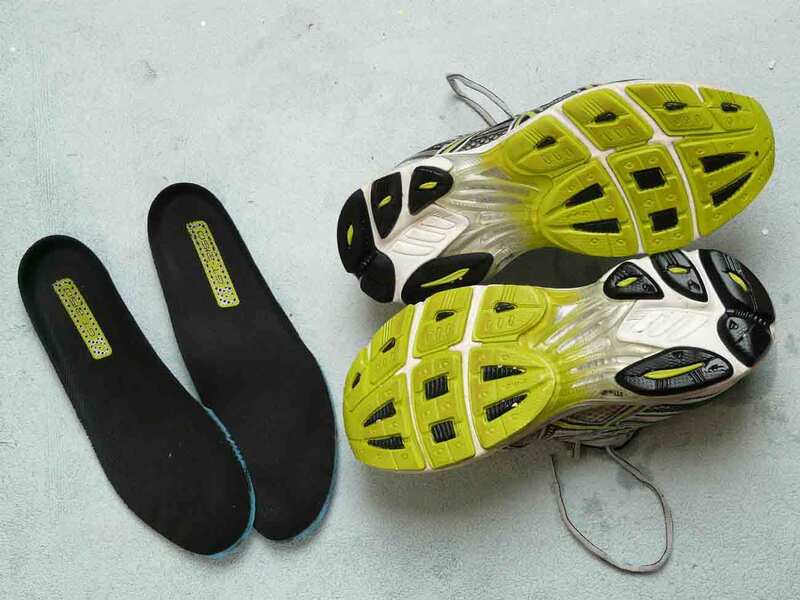 Here is what you need to do to wash shoe insoles. Remove the insoles from your shoes. You might want to leave them to air out for a while if they are particularly stinky. Brush off any debris, like dust, dirt and lint. Fill a container, bucket or sink with hot water. Add in a few drops of mild liquid dish detergent and mix well. Take the scrubbing brush and dip the bristles in the hot water and soap solution. Using a circular motion, scrub the insoles with the brush. Pay particular attention to the stained areas and the areas around the toes and heels. This is where bacteria can build up, resulting in smelly insoles. Work the soap well into the insoles. Wet the brush as necessary, but make sure not to soak the insoles. When the top is clean, turn the insoles over and clean the bottom. Once you finish scrubbing with the brush, remove any soap residue with the clean cloth or sponge. Allow the insoles to dry thoroughly. This can be done by putting them on a dry towel, hanging them on the clothesline or placing them on the dish rack. The more air you can get circulating around them, the better. Make sure the insoles are completely dry before popping them back in your shoes. If possible, dry your insoles in the sun. The sun can disinfect your insoles, killing off any lingering bacteria. Some shoes are machine washable. Once you have removed the insoles, place washable shoes in the machine to clean them as well. 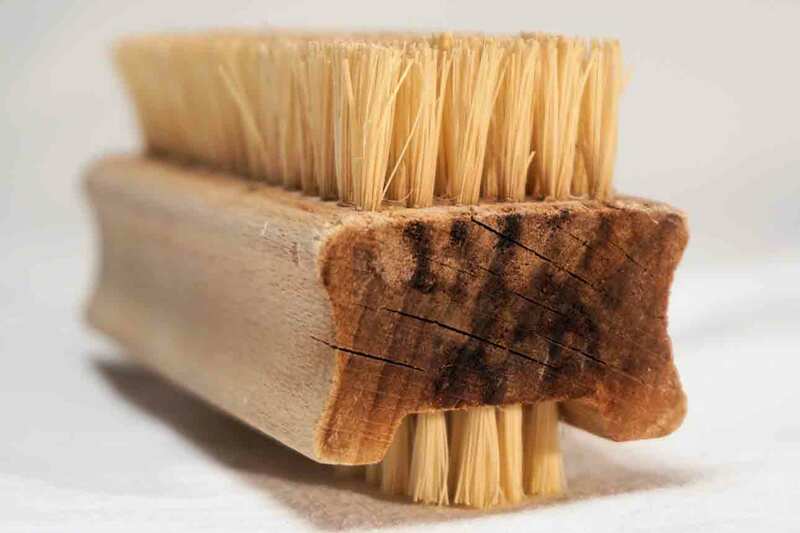 An old toothbrush can be used in place of a scrubbing brush to apply the soapy mixture and get the insoles clean. Vinegar has been used as a disinfectant for more than 2000 years. It can act as an antibacterial agent as well as a deodorizer. It will refresh your smelly insoles by removing the odor left by your feet. Place equal amounts of vinegar and water in your bowl or sink. Submerge your insoles in the solution and leave for about three hours. Remove the insoles from the solution. Rinse the insoles in fresh running water to remove the solution. Leave the insoles to air dry—on a towel, dish drainer or clothesline. Leave overnight or longer, making sure the insoles are completely dry before placing them back in your shoes. Adding a few drops of your favorite essential oil to the water/vinegar mixture will leave your insoles smelling sweet. Try scents like tea tree or pine oil for a fresh smell. 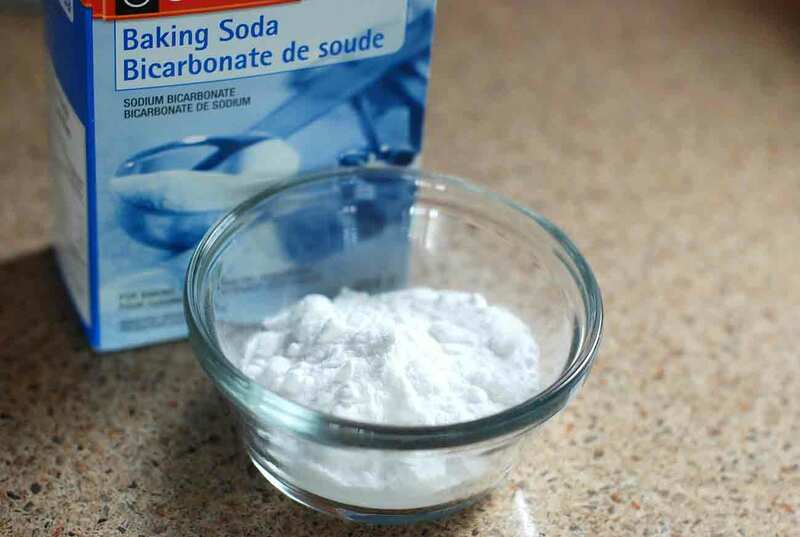 Baking soda has been shown to have excellent deodorizing properties. One study shows it can help reduce the odor in garbage cans by up to 70 percent. Now we’re not saying your insoles are that malodorous, but baking soda will help make them less smelly. Ziploc bag or sealable container. Place a few ounces of baking soda into the Ziploc bag or container. Put the insoles in the bag or container and make sure the upper side is completely covered with baking soda. The more surface of the insole that is in contact with the baking soda, the better it will remove the odor. If you don’t have a bag or container, lay the insoles on an old towel or some newspaper and sprinkle baking soda all over the upper side. Leave the insoles in the baking soda overnight. Next day, remove the insoles from the baking soda. Leave them to air for a few minutes. Place the freshly smelling insoles back in your shoes. Make sure your insoles are dry before using baking soda on them. This is also a good way to deodorize your insoles after cleaning them. This solution can be used as often as you feel necessary. Rubbing alcohol or isopropyl alcohol has disinfecting and antibacterial properties. It will help kill any bacteria on your insoles and leave them odor-free. Mix equal parts of water and rubbing alcohol in a spray bottle. Shake well to ensure that they are mixed together. Spray your insoles with the water and alcohol mixture, on both sides. This can be done generously, as the alcohol will dry quite quickly. Let your insoles air for a while: place them on the clothesline or outside in the fresh air. Make sure they are completely dry before placing them back in your shoes. If you don’t have rubbing alcohol, hydrogen peroxide or white distilled vinegar in a slightly higher concentration will also work. This YouTube video shows you how to clean your insoles using the methods we have outlined. Cleaning insoles that you can’t remove from your shoes can pose a little more of a challenge. Don’t despair, however, there are still ways to stop them resembling a strong smelling cheese. Dryer sheets can be placed inside your shoes overnight to make them fresher. They will leave behind a fragrance to neutralize the smells and help remove the odor. If your shoe material is suitable, you can try steaming the inside of the shoe to kill any bacteria. Use a handheld steamer, the type that’s designed to take creases out of clothes and clean upholstery. Leave the shoes to dry thoroughly before wearing them. This method should not be used on suede shoes, as it could damage them. Charcoal is another superb odor eater. Simply fill a sock with activated charcoal and place it inside your shoes overnight. It will absorb the smells, leaving them fresh. Baking soda can also be used on non-removable insoles. Simply sprinkle it into your shoes and leave it overnight, then shake out the excess the next morning. Leave the shoes to air for a while before wearing them. Cat litter is another great product for absorbing nasty smells. Pop some clean cat litter inside a small cloth bag or a thin sock. Put it in your shoes overnight and it will take away the smell from your insoles. There are also a few products available on the market that will deal with smelly insoles that can’t be removed from the shoes. An all-natural product, such as the Rocket Pure Natural Shoe Deodorizer, contains essential oils, including tea tree, eucalyptus, mint and thyme. Simply sprinkle some of the powder in your shoes and let it do the work. Another product designed to remove odor from shoes is the Stink Boss. It uses ozone and heat to kill bacteria and eliminate odors. This is a box-like appliance that you place your shoes in, turn on for 90 minutes, and leave it to clean and deodorize. Leather can be more delicate than fabric-based insoles, and needs special care. Try the following technique to get the grime off and wash shoe insoles made of leather. Two cotton or flannel cloths. Dampen one cloth, make sure it is moist but not wet. Pour a few drops of saddle soap on the cloth. Rub it on the insoles, forming a lather. Once the insoles are clean, remove the lather with the second moistened cloth. Allow the insoles to dry thoroughly in an airy place. If you cannot remove the leather insoles, wipe them clean with a diluted solution of alcohol or distilled white vinegar. Allow them to air dry. This will kill the bacteria. The baking soda solution will also work on leather insoles. This YouTube video from Relief Medicare Shop shows how to use baking soda on insoles. 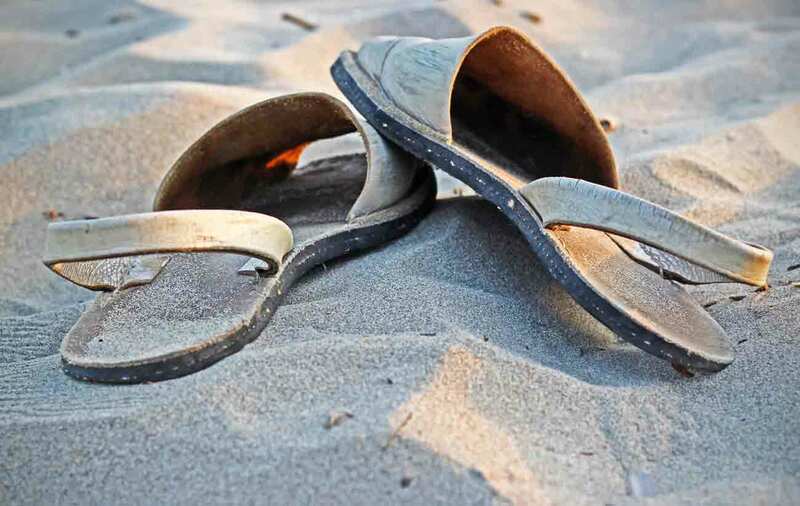 Sandals come in different materials and, as they are open, the insoles are relatively easy to clean. Rubber flip-flops can be popped into your washing machine with laundry detergent. Use a warm cycle and place them out to air-dry afterward. Cork-style sandals, like Birkenstocks, can be wiped down with a damp cloth to remove dirt. A paste made from baking soda can be spread over the footbed and left overnight. They can then be rinsed and left to air dry. Suede sandal insoles need a bit more TLC. You can use sandpaper to gently rub away any dirty marks. A small amount of dish soap and water can be used with a toothbrush to remove more stubborn stains from the insoles. Can You Wash Shoe Insoles in a Washing Machine? Insoles are delicate parts of a shoe and should not be put in the washing machine. Hand cleaning, using one of the methods we have outlined, will prolong their life. 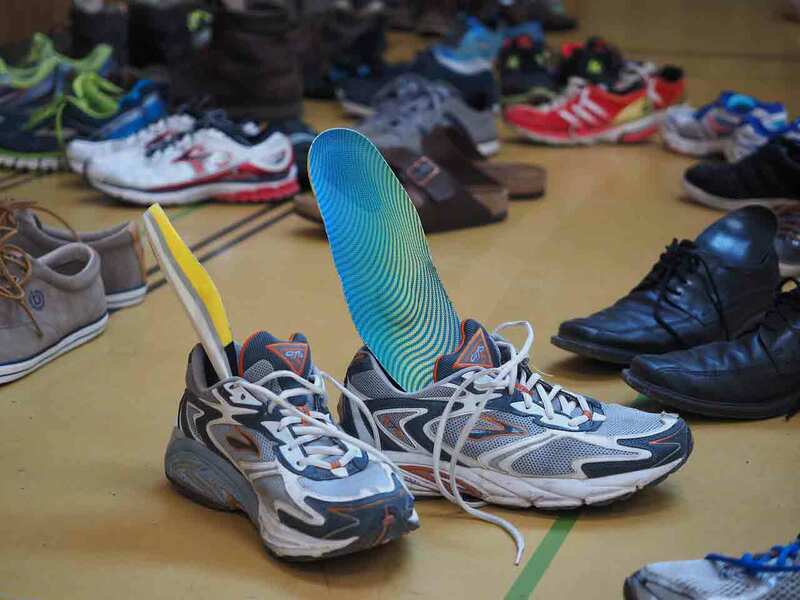 There are a few things you can do to prevent dirty and smelly insoles. Wash your feet well and wear clean socks each time you change or put on shoes. Socks also absorb the moisture from your feet. Change your shoes regularly; try not to wear the same pair of shoes each time you go out. Use antifungal or medicated powder, such as Dr. Scholl’s Spray Powder, if you are prone to funky smelling feet. My insoles are no longer grubby, and they smell sweet too. Why don’t you give yours some TLC? You will notice the difference, and it will help your insoles—and possibly your shoes—last longer. We hope you enjoyed our simple guide to keeping shoe insoles fresh. Let us know how you get on cleaning your own insoles. If you have any ideas we don’t know about, leave a comment below. If you find this article useful, don’t forget to share so others can benefit from fresh smelling, clean insoles. Cleaning my hubby shoes is a very difficult task for me. The shoes create a very bad smell. I was worried about cleaning. After I read out your tips, cleaning is very simple to me. Thanks for your tips.